As freshman pour back into campus, the Bears’ women’s basketball team is halfway across the world, in the midst of a trip through Australia and New Zealand that opened with a win on Saturday. Against a New Zealand Premier team composed of many of the nation’s best young players (some considerably younger than college-aged), Cal let the game hang in the balance a little longer than should have been necessary but pulled out the 77-69 win. The Bears struggled to find an offensive rhythm in the opening minutes of the first quarter. While they were getting quality looks at the basketball, both beyond the three-point line and at the rim, they couldn’t convert the opportunities. Cal found its spark halfway through the first quarter with a play straight out of the Harlem Globetrotters playbook. With a little under six minutes left in the quarter, sophomore guard Mi’Cole Cayton connected with two New Zealand defenders going up for a lay-up. Cayton hit the floor, the two defenders stumbled well out of the paint, and the ball dropped straight into the sophomore’s hands. While on the floor, Cayton rose to a knee and positioned her body slightly to the right of being directly underneath the basket. Instead of rising to her feet, which would have given the defense enough time to recover and contest the shot, Cayton quickly went up for the put-back while only on her right knee and added the perfect amount of spin to record the bucket. Cayton’s display of athleticism and skill didn’t energize just the crowd, but her teammates as well. The sophomore’s dazzling move kicked off a 10-0 Cal run — junior Kristine Anigwe scored five quick points right off the bench including an and-one and senior Mikayla Cowling drained a three-pointer. By the end of the first quarter, the Bears established a 22-13 lead. 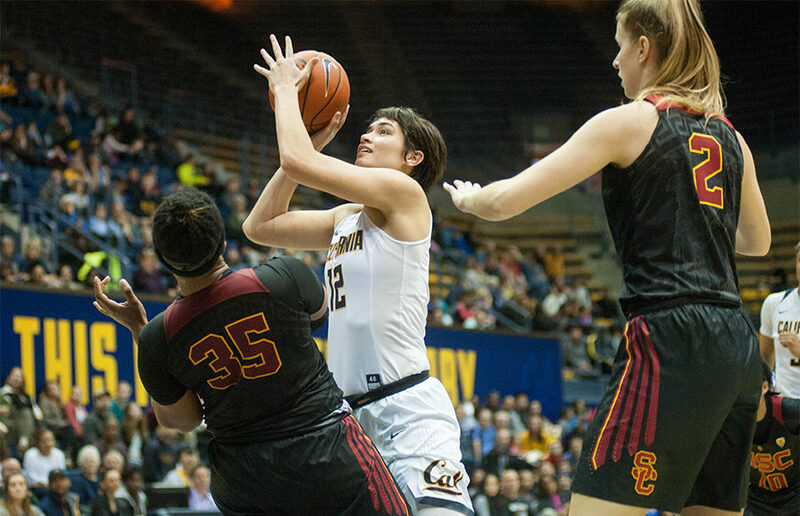 Similar to the first quarter, Cal’s offense sputtered to open up the second and New Zealand took advantage, cutting the Bears’ lead to just three points at only two and a half minutes in. The offense stayed cold until around the six-minute mark, when freshman Kianna Smith came in off the bench to nail a mid-range jump shot on an assist from senior Penina Davidson, who herself hails from New Zealand and is a member of the New Zealand Women’s National Team. The Bears offense suddenly found its spark after that play and scored 15 more points before the half was over, going to the locker room up by eight points. The ball movement was incredibly crisp, and of the four players who scored in that stretch, three were bench players. The Premier team started to rely more heavily on the teenagers they put on the court, with 15-year-old Charlisse Leger-Walker, who would go on to lead all scorers with 23 points, impressing most of all. Incredibly adept at banging down low in the post and with a great sense for the game — both in terms of finding open teammates and knowing how she could best attack herself — she was most of the reason the Premier team was hanging in the game through the quarter. Four points from Anigwe at the end of the quarter took the Bears out of the danger zone. Another teen, Sharne Pupuke-Robati, took over for New Zealand in the fourth quarter, scoring four early on to take Cal’s lead back down to a single point. 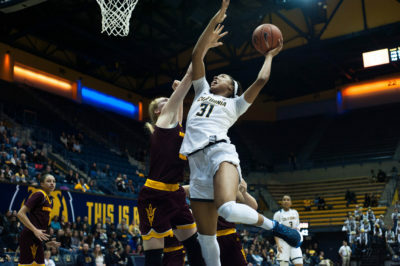 But the Bears wasted no time in responding, as sophomore CJ West scored off an offensive rebound, came up with a huge block that lead to an Asha Thomas three-pointer, and scored one more time on a nice move in the post. The Bears were a bit lacking in physical toughness down low, and West was the exact right antidote. Another four point spurt from Anigwe essentially closed the game. Anigwe unsurprisingly led the Bears in scoring despite coming off the bench, but with 15 points, the scoring burden was well distributed. The game probably would never have been in doubt if there had been more defensive fire, but it’s hard to read too much into defense in an exhibition match, and the offensive execution bodes well for Cal’s chances in the upcoming season.